Is there any better way to start the day than sausage, egg, and cheese? 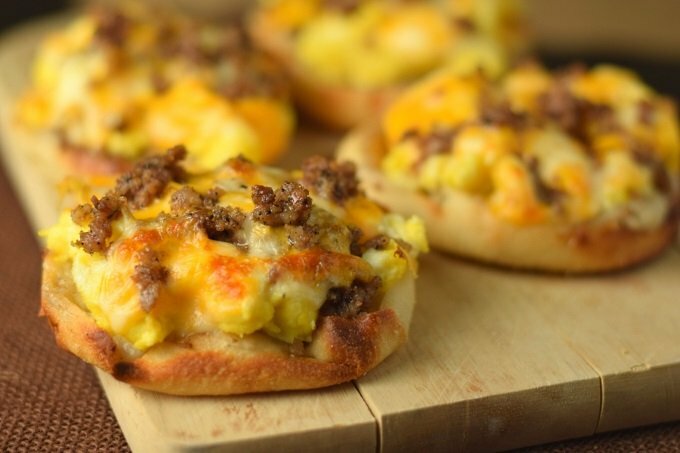 Take it to the next level with this English Muffin Breakfast Pizza recipe! I loved making breakfast, not only because it gives me a peaceful way to wake up and enjoy my coffee as slowly shake off my catatonic state, but because it is decadently delicious! A hearty breakfast platter including some combination of sausage, eggs, and cheese is the best comfort food to start the day. If you add in southern style sawmill gravy and English muffins you have what may be the best breakfast comfort food ever! 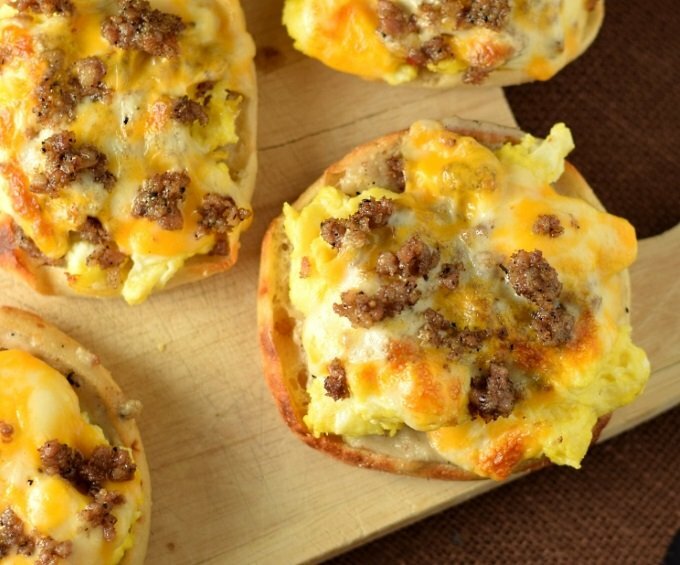 When added to a toasted English muffin topped with egg, sausage and cheese, it almost tastes buttery. If you are not comfortable making a perfect batch of sawmill gravy yourself, “how to make sawmill gravy” for detailed instructions so you can nail it on the first try! If you want to cheat and buy sawmill gravy, or use a mix packet, that is fine too. The recipe I created for you includes breakfast sausage, since it is needed to make the sawmill gravy. However, you can easily substitute bacon if you prefer that instead. And, well, since it is technically pizza, feel free to go crazy and add whatever toppings you prefer. I promise not to judge you, or at least to do so quietly. All of the equipment needed for this recipe is standard kitchen fare. However, I do recommend having a cast iron pan (affiliate link) to make the sawmill gravy in. Though it is certainly possible to make it in another pan, the heavy bottomed cast iron pan will help keep the heat more consistent and prevent scorching if used properly. The texture of a breakfast pizza is best if the English muffins are toasted. Then simply paint them with a satisfying dollop of gravy, top with scrambled eggs, cheese and sausage. After a brief vacation under the broiler, your breakfast pizzas will be hot, bubbly, and stick-to-your-ribs delicious! A hearty breakfast platter including some combination of sausage, eggs, and cheese is the best comfort food to start the day. If you add in southern style sawmill gravy and English muffins you have what may be the best breakfast comfort food ever! Cook meat in cast iron pan until well done. Remove from pan and pour off all but 1/4 cup of fat. Lightly toast English Muffins in toaster while making gravy. Scramble eggs in a non-stick skillet, add a small dash of milk to make them fluffier, if desired. Turn oven broiler on high and assemble pizzas on baking sheet. 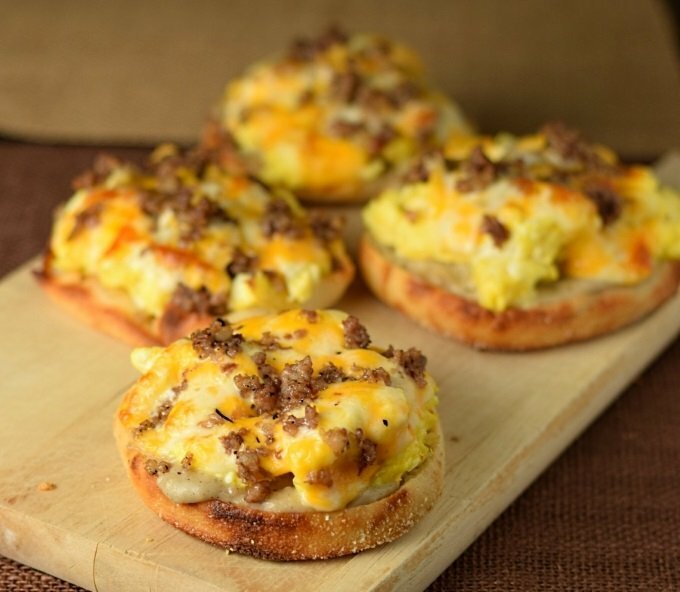 Add sawmill gravy to the open faced toasted English Muffin then top with scrambled eggs, slice of cheese and sausage. Toast under broiler until cheese is bubbly and melted. If you are feeling adventurous, try this recipe with my Cheesy Chorizo Gravy too! IF YOU LIKED THIS RECIPE be sure to check out my Homemade Hash Browns recipe too! This recipe was originally published on FoxValleyFoodie.com April 12, 2015. 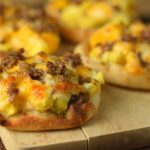 If you enjoyed reading English Muffin Breakfast Pizza then you should probably like me on Facebook and follow me on Pinterest too. That’s what I would do at least, and if you are willing to take my advice on the food you put into your body you should probably follow my advice on that too. Can these be frozen? They’d be great for school mornings! Great idea! I haven’t tried freezing them, but I bet it would work just fine. Reheating in the oven at 350 should be a safe bet! I made these for a Breakfast Supper for my Granddaughters and husband. They are delicious! The only adjustment I made to the recipe was, I added a pinch of Red Cayene Pepper to the gravy to give it a little kick. They will definitely be made again and I shared the recipe on Facebook. Thank You ! A pinch of cayenne sounds like a fantastic addition! I would really enjoy that! It says 1/4 flour. 1/4 cup I am assuming? I’m really sorry. I switched over to a new recipe plugin and some formatting got screwed up. Yes, it is 1/4 cup. I made these and they were delicious. I also froze them for other days and used my toaster oven to reheat one for 10 minutes (I had thawed one in the frig over night). I tried to microwave one, but the muffin got too chewy. Tomorrow I am making them with bagels. I also used shredded sharp cheddar and a little mozzarella cheese. This pizza is a family favorite pizza. Just made these for breakfast this morning and I LOVE them. These little handheld pizzas make a fantastic and quick lunch option. So, thanks for your great recipe. These were so good! I added the cooked sausage into the eggs when they were about half way done instead of putting them on top of the eggs. Easier in my opinion. Also put more gravy on top right before serving. Yum!